The manufacturing industry is up against constantly changing regulations and procedures that can make controlling costs and growing profits tricky. To meet these challenges successfully, manufacturers and distribution businesses need the foresight of a qualified financial professional on their team. Matthew J. 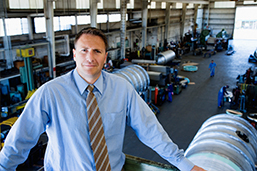 Rice CPA specializes in manufacturing accounting services that can help you achieve your business goals. We have years of experience in this sector and will add value to your business with meaningful financial reports that allow you identify trends and eliminate nonessential costs. We'll also show you how to improve operations, upgrade internal controls, and manage inventory more efficiently. We're different because we offer the capabilities and expertise of a large CPA firm combined with the personal attention and responsiveness of a small firm. To us, no two clients are exactly the same. When you become our client, we spend time answering your questions and learning all we can about your business in order to develop an accounting package around your unique needs. Call us today 704-609-1119 or request a free consultation online to start working with a Charlotte, NC CPA firm experienced in all aspects of manufacturing accounting and tax services.